Today in Masonic History Benjamin Lincoln is born in 1733. Benjamin Lincoln was an American solider and politician. Lincoln was born in Hingham, Province of Massachusetts Bay. Growing up he worked on the family farm and went to school, eventually graduating from Harvard University. At the age of 21 he held his first elected office, town constable. One year later he would join his father in the 3rd Regiment of the Suffolk County militia. In 1757 Lincoln was elected town clerk of Hingham and would hold the job for twenty years. In 1765 he was elected town selectman. During his time in this position the colony grew more and more dissatisfied with British rule. Opposition to the Parliamentary Tax began to change the landscape of the colony. In 1770 Lincoln drafted a resolution, that was passed by the people of Hingham, that urged the non-importation of British goods and condemning the Boston Massacre. In 1772, Lincoln was promoted to lieutenant colonel in the militia. He was also elected as a representative to the provincial assembly, a body that would be dissolved when General Thomas Gage would take over as Governor of the colony. The provincial assembly would be reformed into the Massachusetts Provincial Congress. In the Provincial Congress, Lincoln was placed on committees overseeing militia and supplies. These positions would be critical when the American Revolution broke out. In 1776, Lincoln would be promoted to major general of the Massachusetts Militia. In May of that same year, Lincoln directed forces that successfully drove British ships from Boston Harbor. Lincoln began lobbying state representatives to the Continental Congress to grand him a commission in the Continental Army. The commission would not come until 1777 at the recommendation of General George Washington. Washington would say of Lincoln, he was "a gentleman well worthy of notice in the Military Line". After being commissioned Lincoln would be sent to Bound Brook, New Jersey and would suffer his first defeat at the hands of no less than Lord Cornwallis himself. Lincoln would barely escape the Battle of Bound Brook without being captured. In July of 1777, Lincoln was sent north to aid in the defense of northern New York. He would be assigned a force in southern Vermont to harass British supply lines. During the Battles of Saratoga, specifically after the Battle of Bemis Heights, Lincoln's militia would push the British back during a reconnaissance mission. Because of this maneuver, Lincoln is credited with putting General John Burgoyne, a British general, to surrender at Saratoga. Unfortunately Lincoln would not be there during the surrender due to a would to his ankle. A musket ball would shatter his ankle, for the rest of his life Lincoln's right leg would be 2 inches shorter than his left. In 1778, after convalescing, Lincoln returned to duty. He was put in charge of the Southern Theatre. After an unsuccessful siege of Savannah, Georgia Lincoln retreated to Charleston. There he would be forced to surrender 5,000 troops. Lincoln asked the South Carolina legislature to arm 1,000 slaves. Unfortunately the South Carolina instead sought to negotiate with British Commanders to allow British forces to pass through South Carolina and Lincoln was captured. In 1780 Lincoln was exchanged for a British major general. 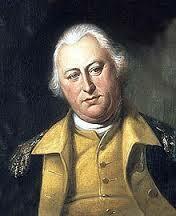 He would return to Washington as part of the main army in Virginia. Lincoln, as Washington's second in command, would accept Cornwallis's surrender at Yorktown. Lincoln was a member of Rising Sun Lodge in Massachusetts.